Hi! It's a beautiful, still Spring evening here and I've just been outside cutting some roses for inside. A perfect Friday evening! Today's card uses the sketch from CAS(E) This Sketch, albeit flipped from landscape to portrait. 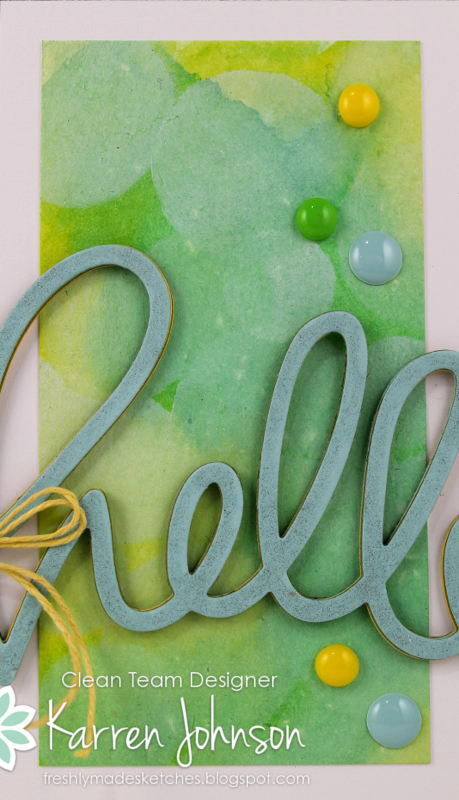 The background watercolored panel is layered behind the card base using foam tape to give added dimension. 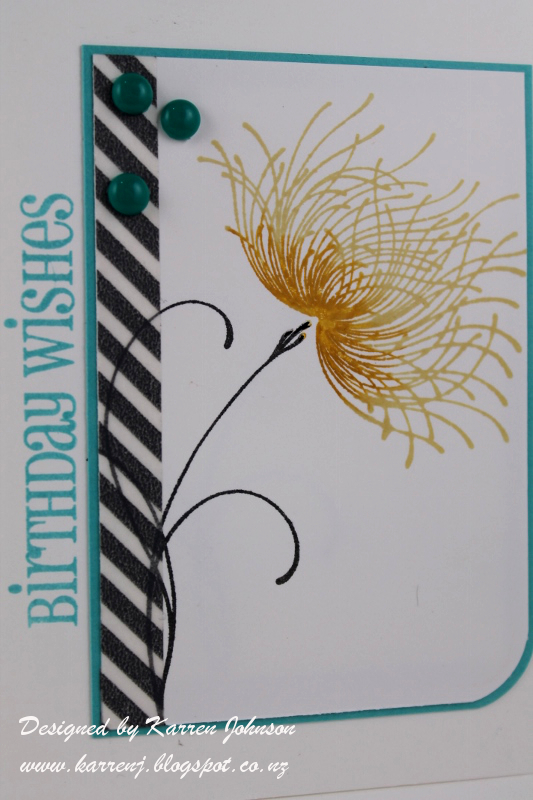 The flowers were stamped on the card base and then the vertical panel was cut around it, a la Maile Belles. The centers of the flowers were painted with clear Wink of Stella to give a nice, subtle shimmer. Hi! 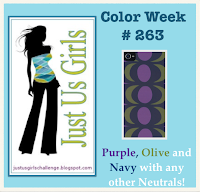 Today's card was made using the fabulous sketch at The Paper Players and the colors at Color Throwdown. As this is a birthday card and I used washi tape, I'm also entering this at Seize the Birthday. I inked the head of my Penny Black flower in Goldenlocks ink then used a Wild Honey distress marker to add some darker shading near the base. I inked the stem in Black Soot. I then used a piece of washi tape for the vertical panel. Audrey Blue was the blue used for the layer and the sentiment and some homemade enamel dots finished this very CAS card. 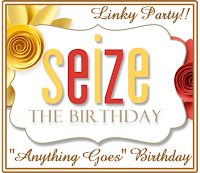 Edited to Add: This card got a shout-out at Color Throwdown, Seize the Birthday and Paper Players. 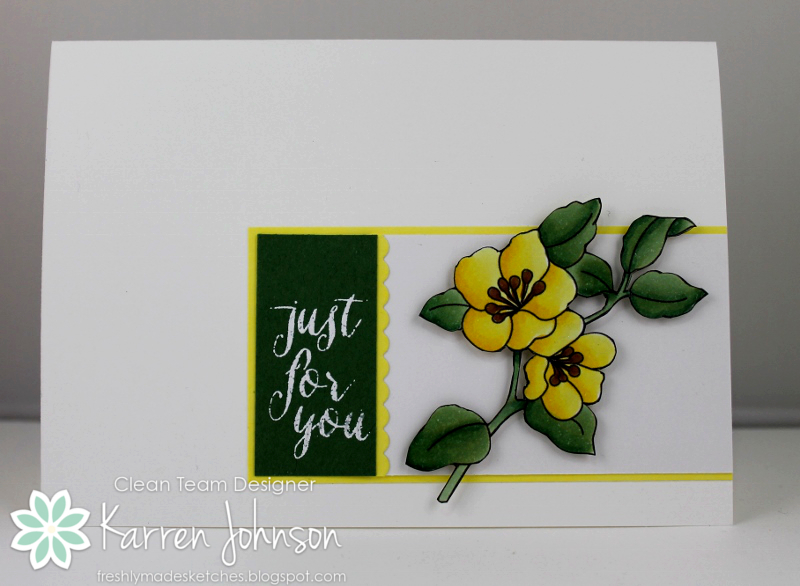 I was not in a very creative frame of mind when I made this card and wrote this post, hence the lame title :) I spent the weekend looking for a new car and test-driving several. Talk about exhausting! I haven't found a car yet, but at least I've narrowed down the list to the make and model that I want. And of course now I have to endure all the phone calls from the car dealers trying to get me to buy their car! Anyway, onto my card. 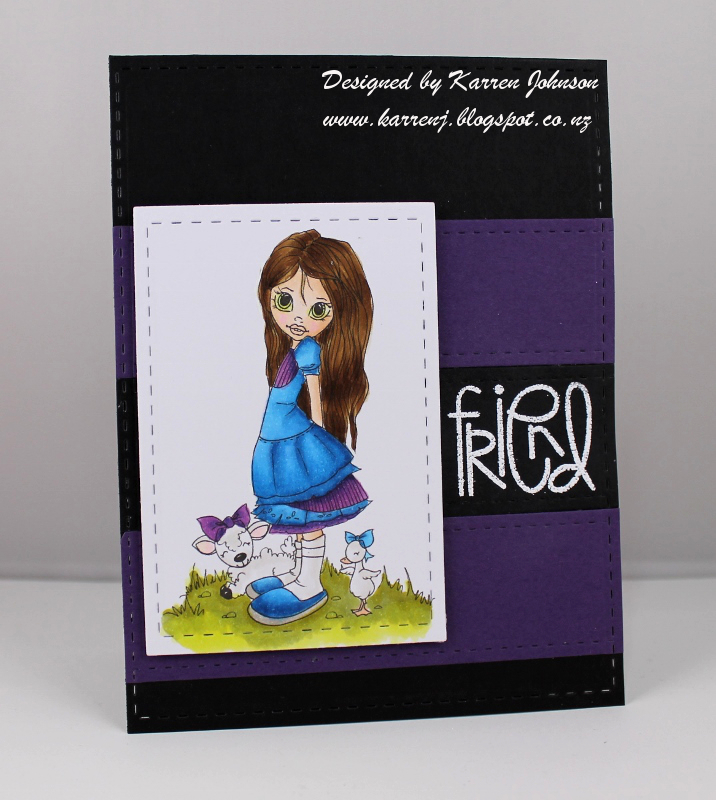 This week at Freshly Made Sketches, the very talented Rita Wright is our hostess. 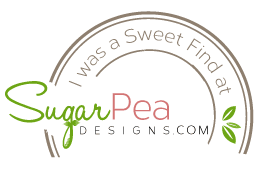 You need to check out her blog - she is now on the Prickley Pear Design Team and is creating some wonderful cards using their images. Thanks for visiting. I hope you have checked out the rest of the design team's cards - they're amazing as usual! Accessories: Sequins, butterfly punch, Dazzling Diamonds, Sequins, Rhinestones, Stitched Mats Rectangles, Circle Nesties, Melon Mambo EP. 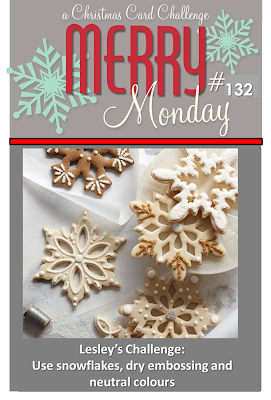 It's Merry Monday challenge day and this week Lesley is our challenge hostess and she is asking for dry embossing, snowflakes and neutral colors. 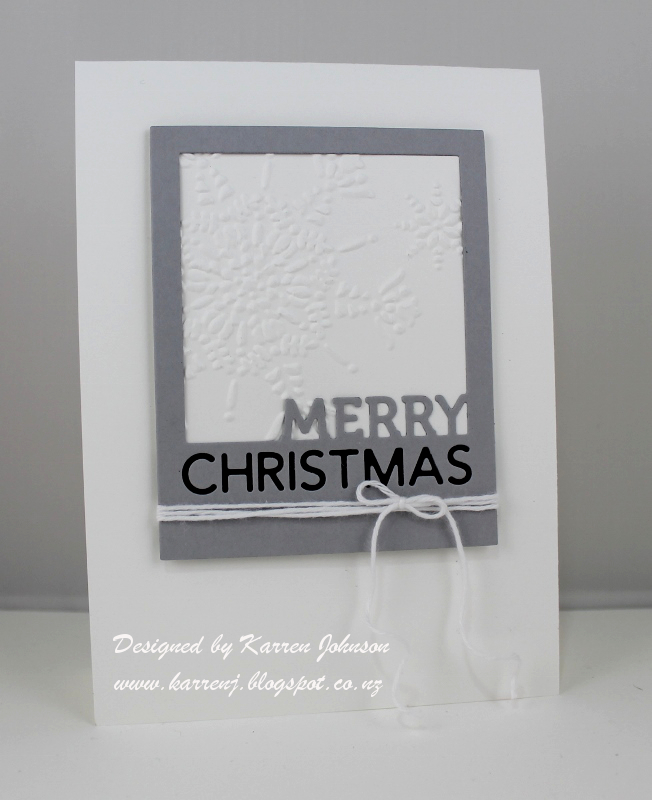 It's hard to see in the photo, but the white panel behind the gray frame is dry embossed with the Northern Flurries embossing folder. 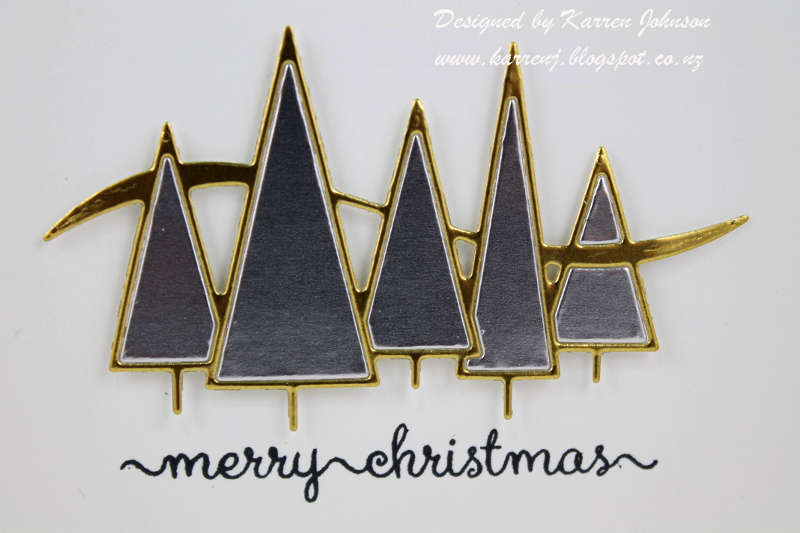 I also tucked a little piece of black cardstock behind the word "Christmas" to make it pop. The whole panel is popped up on foam tape. Thanks for visiting. 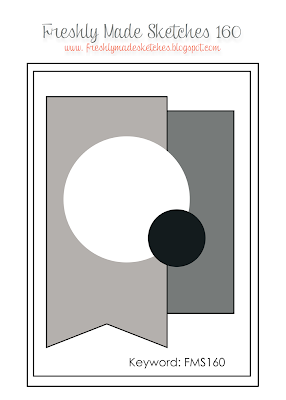 If you haven't already, please check out the gorgeous cards created by the rest of the design team. 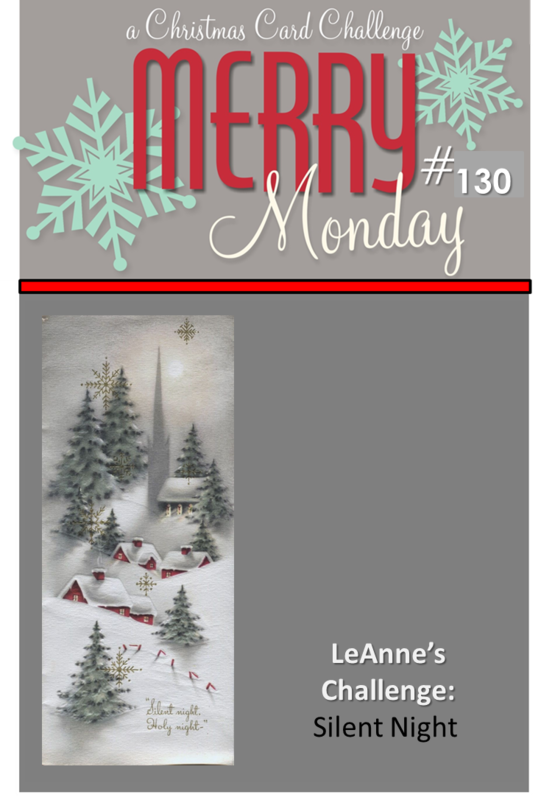 And make a special trip by LeAnne's blog as this is her last challenge with the Merry Monday team. 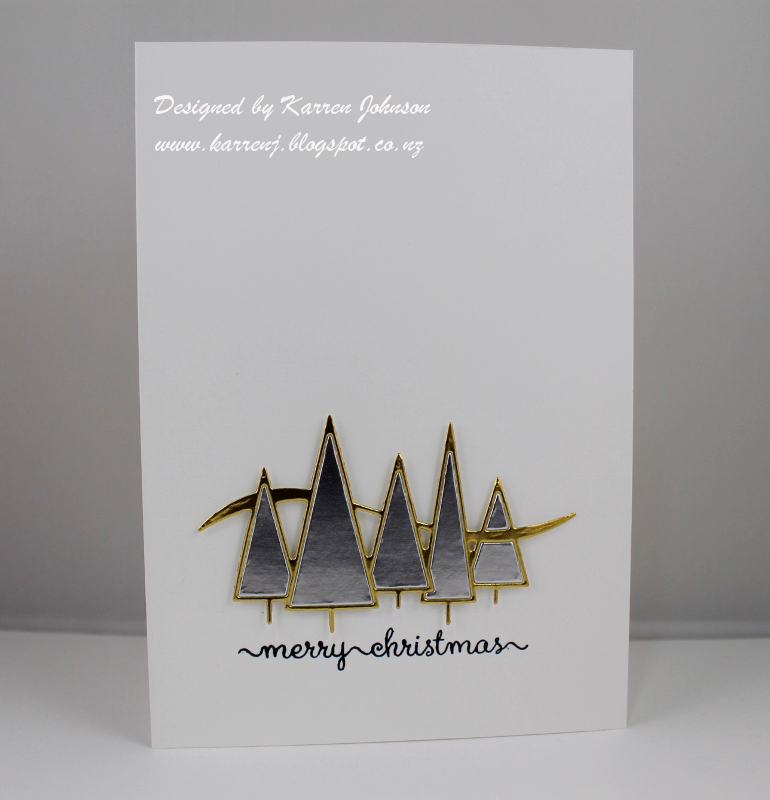 I used the Winter Trees die cut with both silver and gold foil paper to create this shiny row of trees. I mounted it using tiny little bits of foam tape so it's sitting off the card base. 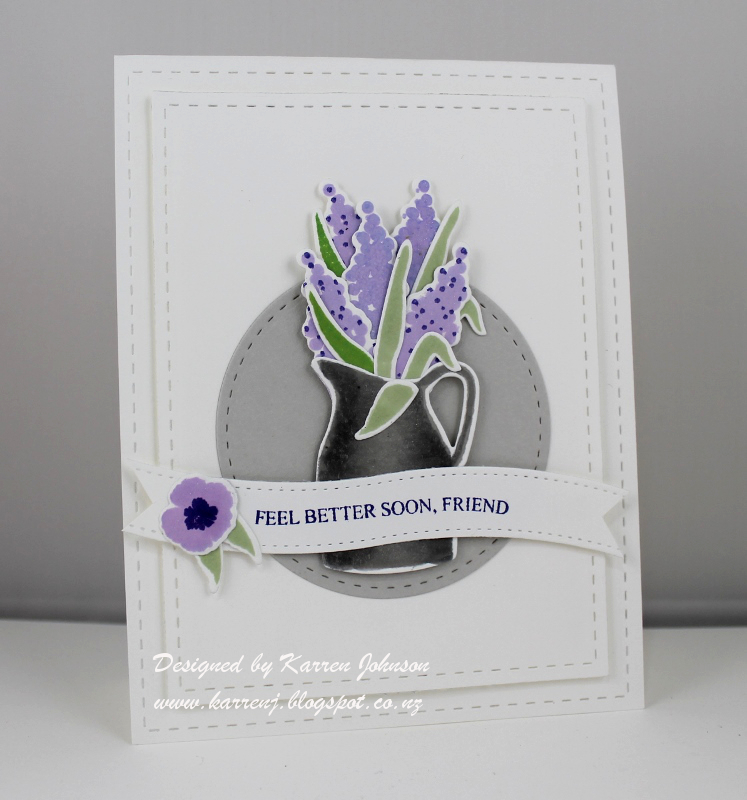 The sentiment is from Clearly Besotted and the third time in two days I've used this versatile set! 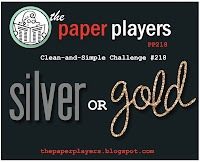 Edited to Add: This card got a mention at Paper Players. This is an old image from PSX which I just adore. I colored it with Copics, even using the colorless blender to move some color - which actually worked this time! The panel was mounted onto Pool Party cardstock then onto the card base. The sentiment is from Verve and the little baby starfish behind the sentiment is from WPlus9. Thanks for visiting. 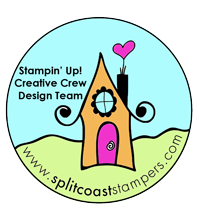 Be sure to check out the Freshly Made Sketches blog and see the wonderful samples from the rest of the amazing design team. Hi and welcome back to my second post today. 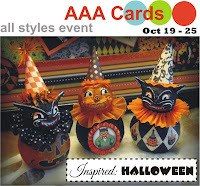 This card is for the current challenge at Less is More, who are asking for a Little Creatures card. 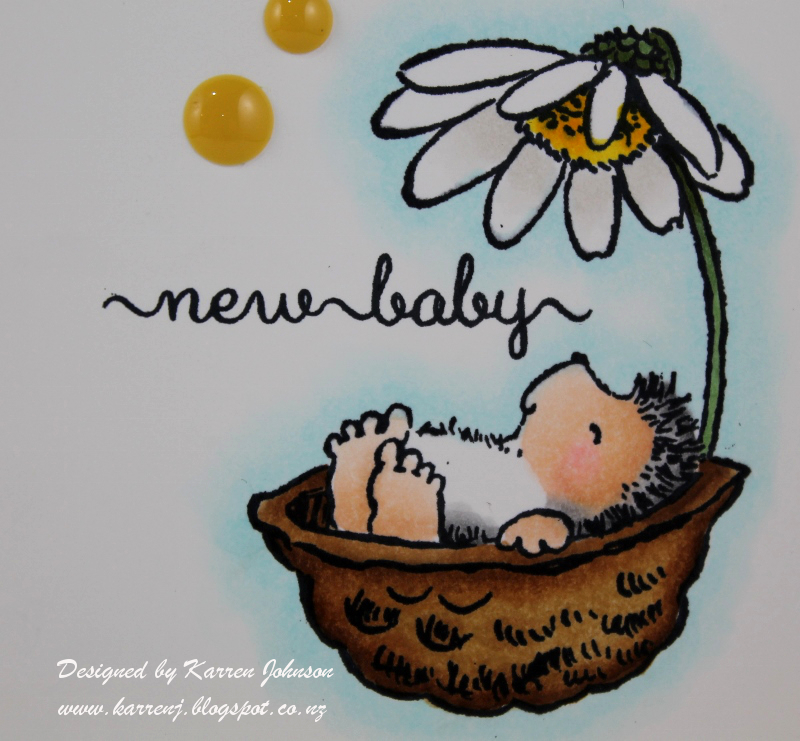 I had to do a bit of searching to find any little creatures in my stash, but finally came up with this old Penny Black stamp of a baby hedgehog and thought it would suffice. 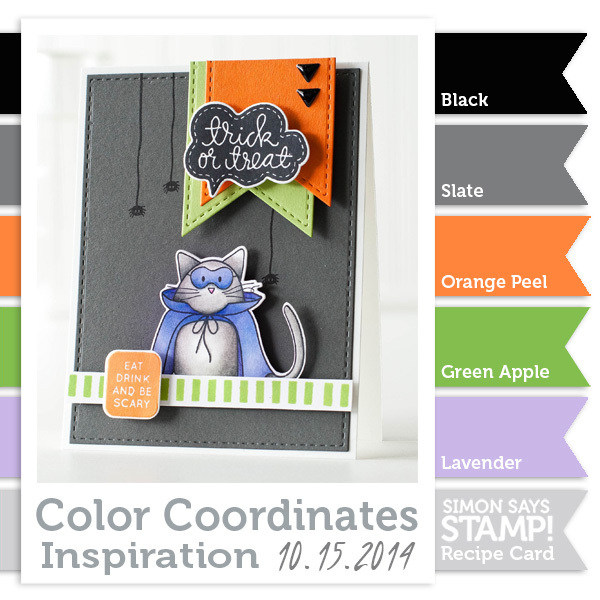 This is effectively a one layer card as the frame is inlaid using the frames die from Simon Says Stamp. I didn't have any lemon cardstock so colored the frame outline using the Lemon Chiffon inkpad. I stamped and colored the hedgie using Copics then put all the card pieces back into the card base. 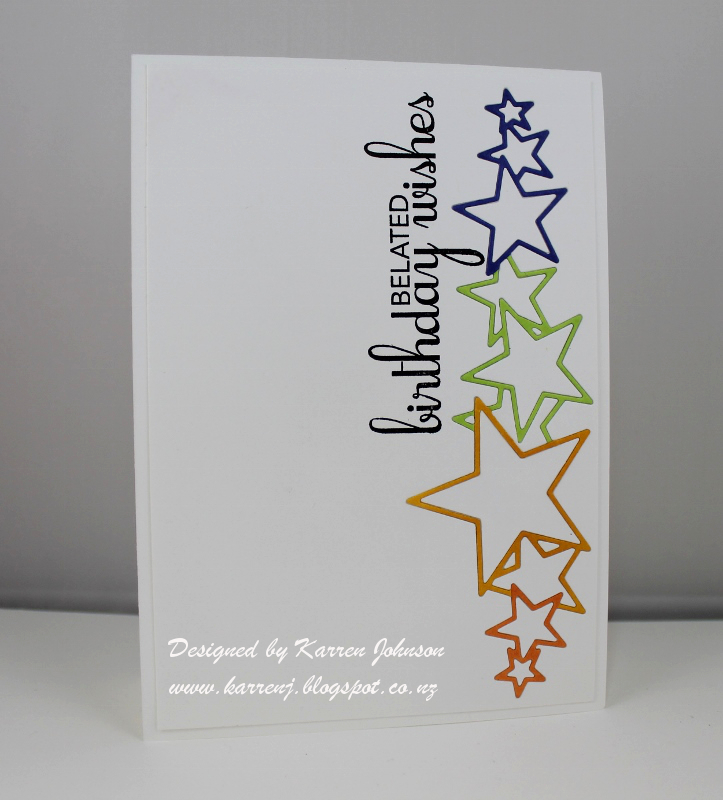 A few enamel dots finished off the card. I printed out the digi image and followed Marianne's instructions on how to color her. 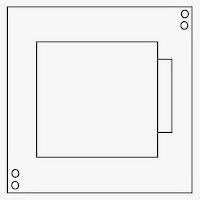 I then die-cut the image using a stitched mats square die. The scallops down the right hand side were cut with a scallop nestie and the sentiment is white-embossed onto a black card base. 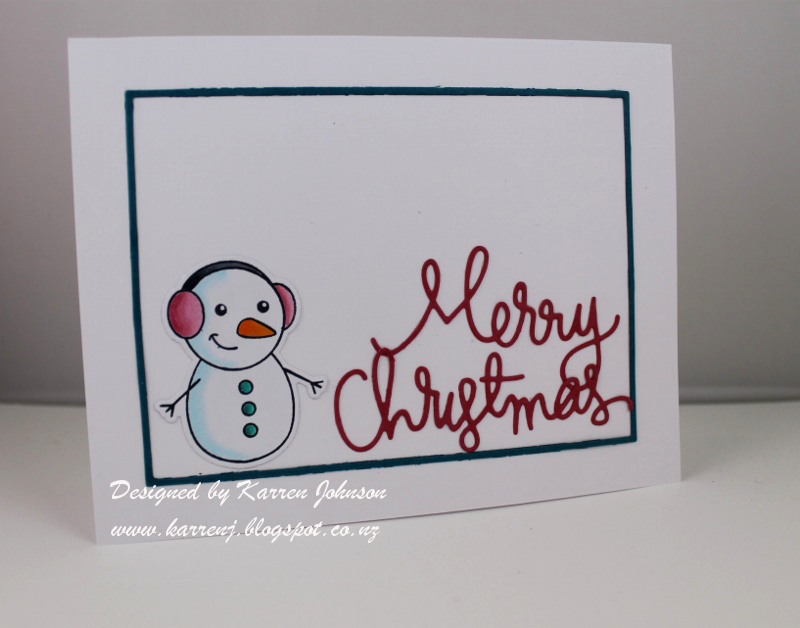 Some home-made enamel dots finished off the card. 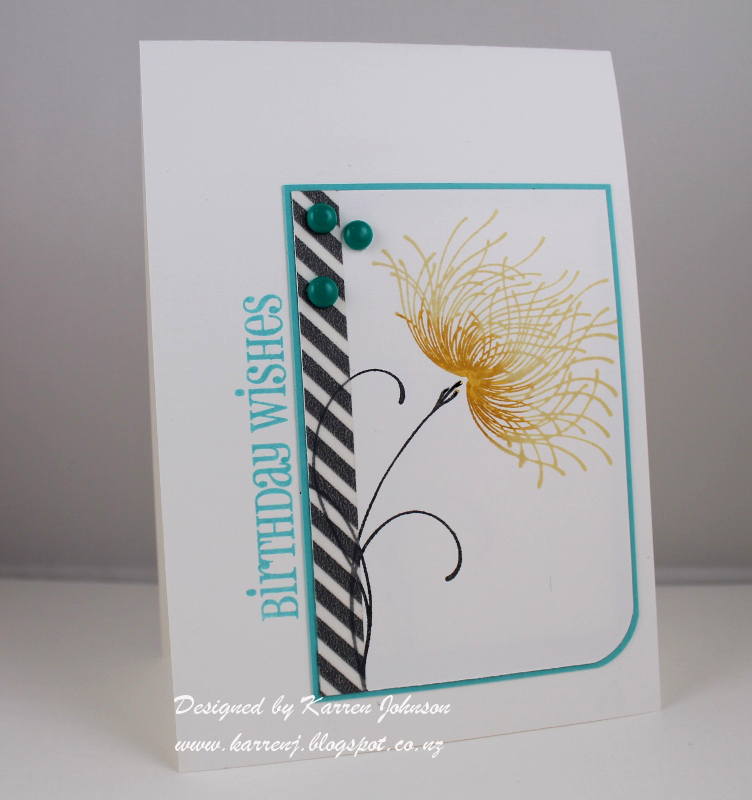 Edited to Add: This card was a winner at Digi Sketch Challenge. Hi and welcome to Merry Monday! It's getting closer and closer to Christmas, so I hope you're building up your stash of Christmas cards? 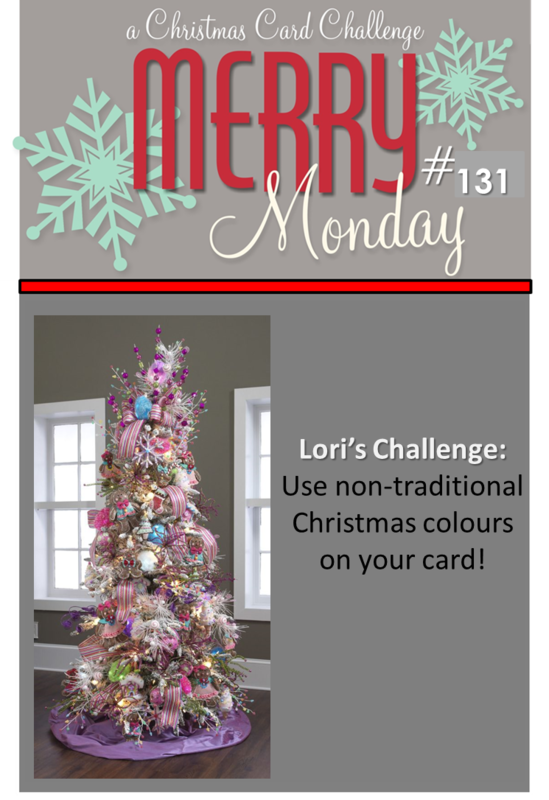 This week, Lori has challenged us to use non-traditional colors on our Christmas cards. For my card, I went with Primrose Petals and Island Indigo against a white backdrop. I got the Winter Friends set from SSS which has the most adorable images. 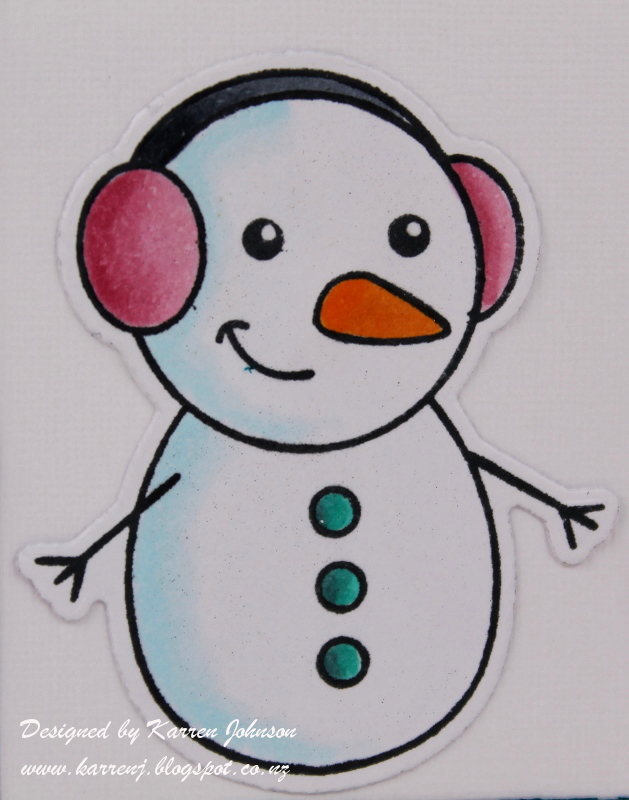 I used the snowman and colored him with pink and teal copic markers before painting him with Wink of Stella. 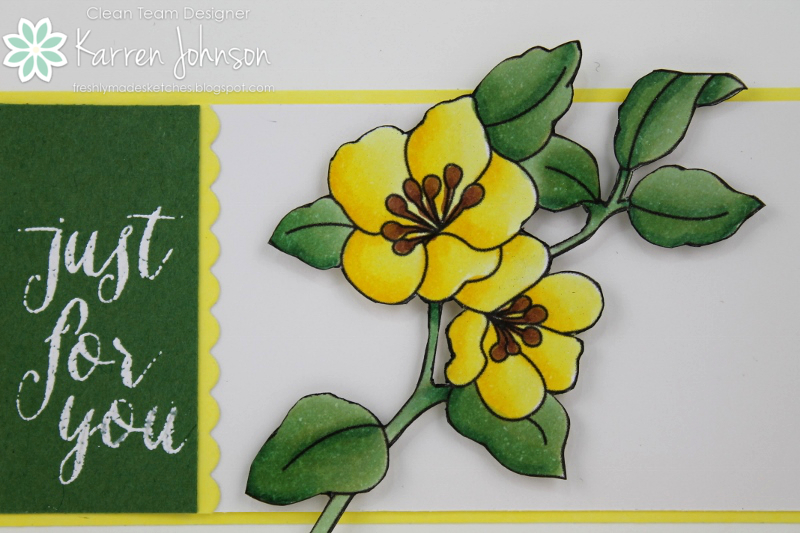 The sentiment was cut from Primrose Petals cardstock. I used the tiny frame from SSS Frames dies to outline my images. Another very CAS card! Thanks for visiting. 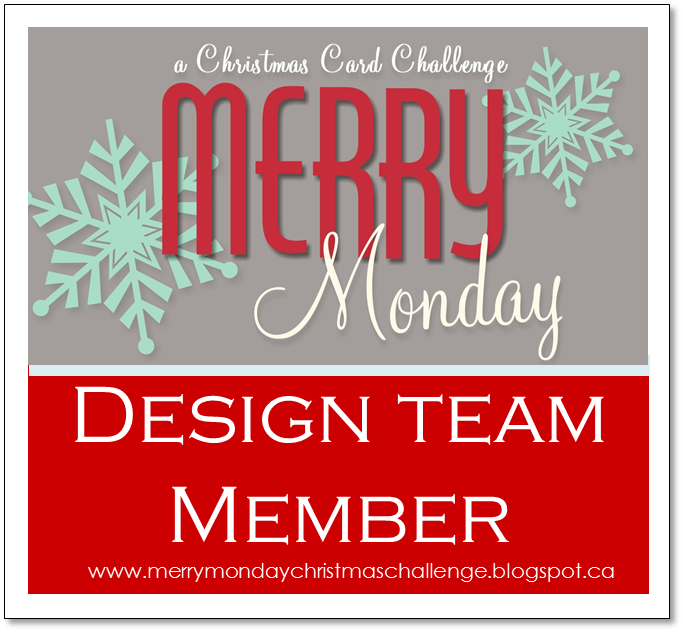 Be sure to check out the fabulous cards from the rest of the design team. 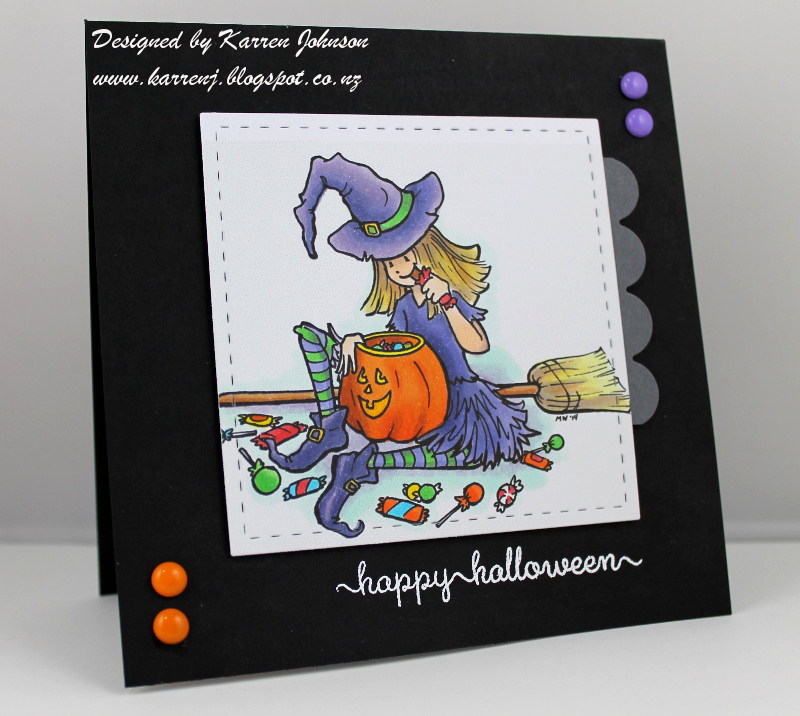 For my second card today, I used the colors from Just Us Girls and the sketch from Pals Paper Arts. I'm trying to get some Copic practice after completing the recent Online Card Class. I bought a few digis from Saturated Canary to practice coloring people and this is one I colored tonight using the colors from Just Us Girls. I went with a purple and black background and some stitched mats to create a bit of interest. 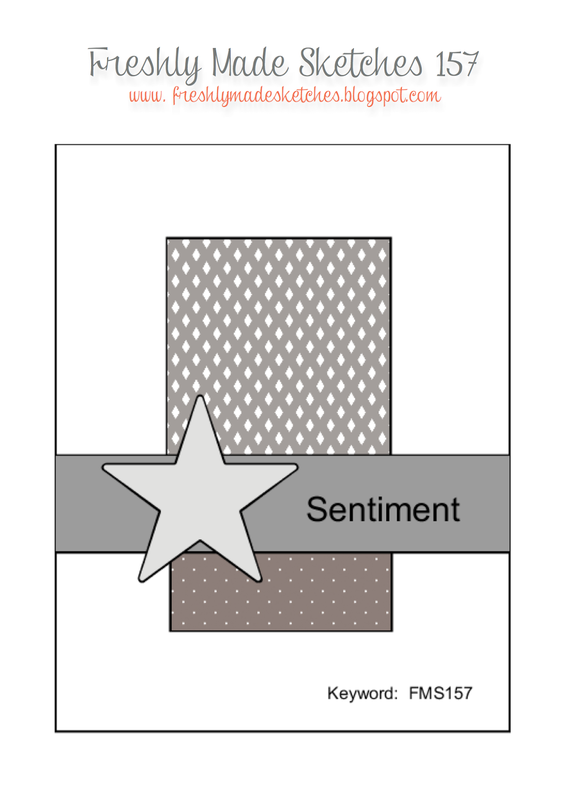 The sentiment was white-embossed on the black panel. Today's card is my first attempt at a galaxy scene and let's just say you need to squint to see a galaxy in this background :) But I'm putting it up anyway. 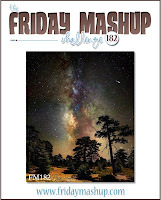 The galaxy theme is this week's challenge at Friday Mashup plus I used the sketch at Mojo Monday - although the proportions are a bit off due to the size of the sentiment. I created my galaxy using watercolor paints. I did try another one using distress inks and might use that another day. 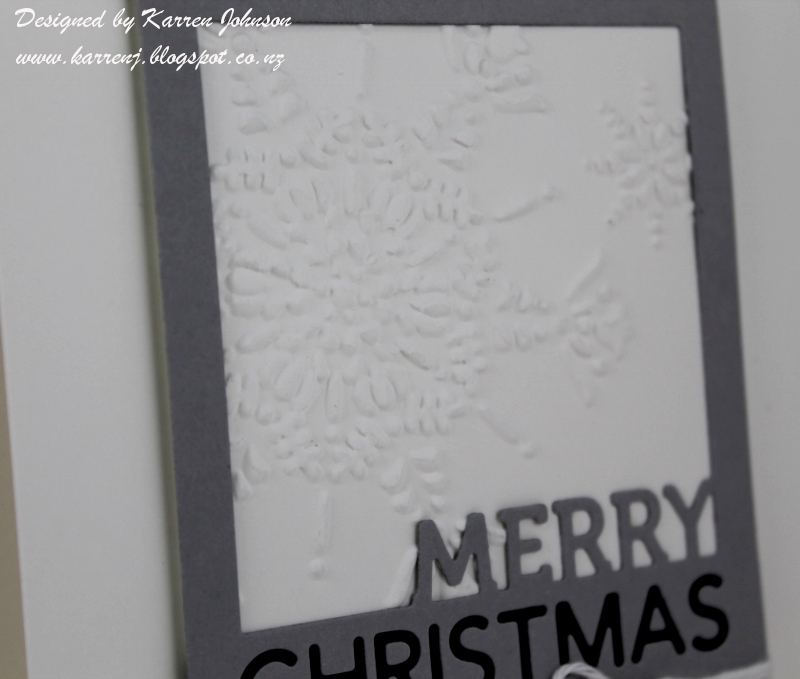 After it was dry, I white embossed the sentiment and stars. I decided the yellow was most prominent so used some Crushed Curry cardstock for the scalloped piece which I scored at the end of each scallop. 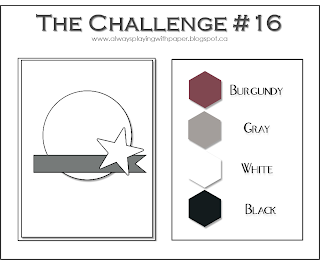 I carried the scoring over to the black panel to mimic the sketch. I wrapped some striped blue twine around the panel before using foam tape to adhere to a white card base. Such an original blog post title, wouldn't you agree? Anyway, welcome to another sketch from the Freshly Made Sketch Challenge. Today, our very own super-talented Dirty Girl (and past Artisan winner), Jen Timko is our hostess. Anyway, I couldn't find a matching yellow so decided to make my own by using the Direct to Paper technique with Squeezed Lemonade ink. Not a bad match! The sentiment was white embossed and came out a bit blotchy for some reason - maybe my Versamark pad needs re-inking. 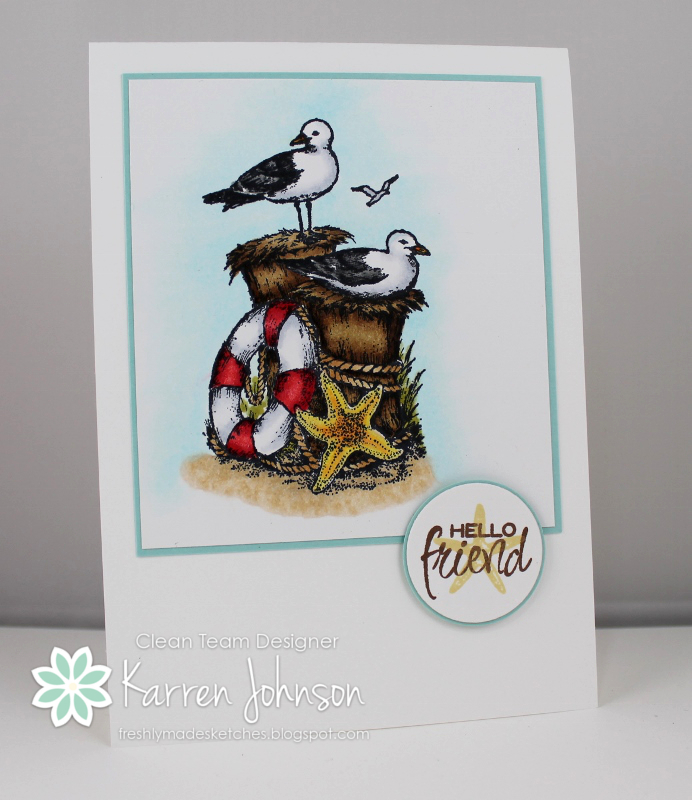 The little scallop was cut using the large scallop frame from Simon Says Stamp's frames dies. The flowers and leaves were painted with Wink of Stella. 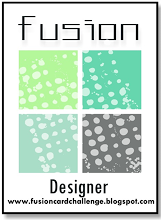 So, after all that, thanks for visiting and make sure you check out the inspiration from the rest of the Design Team. I used Mama Elephant's Sweet Havana set to stamp this card for a friend, going through a tough time at the moment. I stamped the jug with Cobblestone ink, then used some gray Copics to give some depth and roundness to the jug. 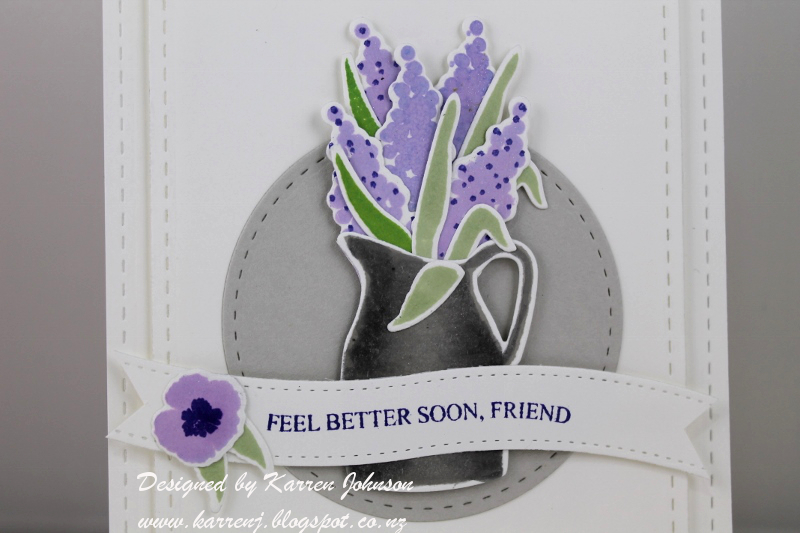 I stamped the flowers in Lavender and Blue Violet ink, leaving a couple of them without the dotty bits to make it look like they are different flowers. In hindsight, it just looks like I forgot to stamp the dotty bits! The leaves were stamped in Beanstalk Green and Green Leaf inks. The banner is from the Tags a Lot die set and is bigger than the banner that comes with Sweet Havana, so I could fit the flower as well as the sentiment. I used Wink of Stella to paint over all the flowers. Edited to Add: This card got top honors at The Challenge. Welcome to my Merry Monday post. 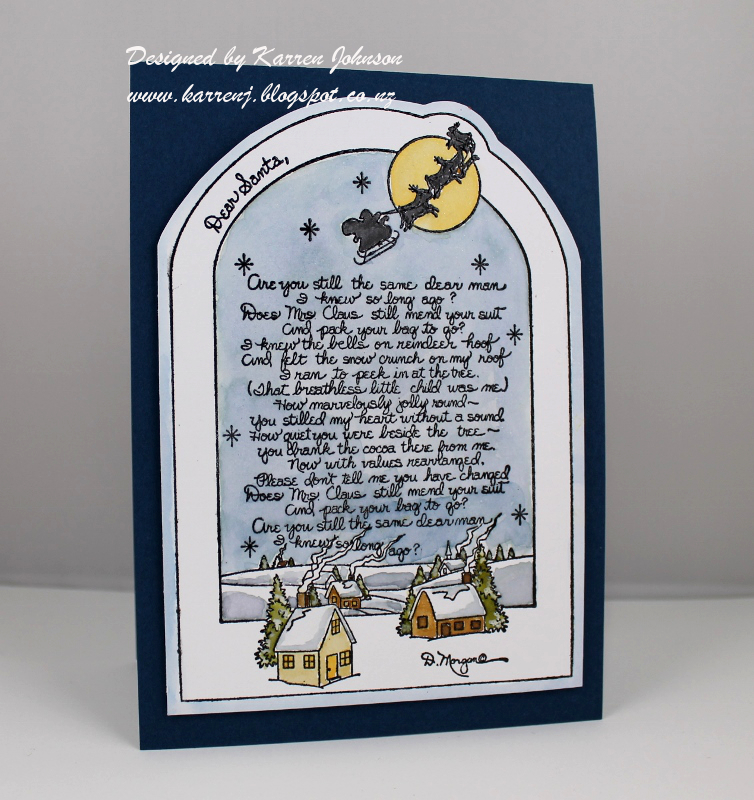 Today, LeAnne is challenging us to create a Silent Night aspect to our card. It even has a church in the background LOL. 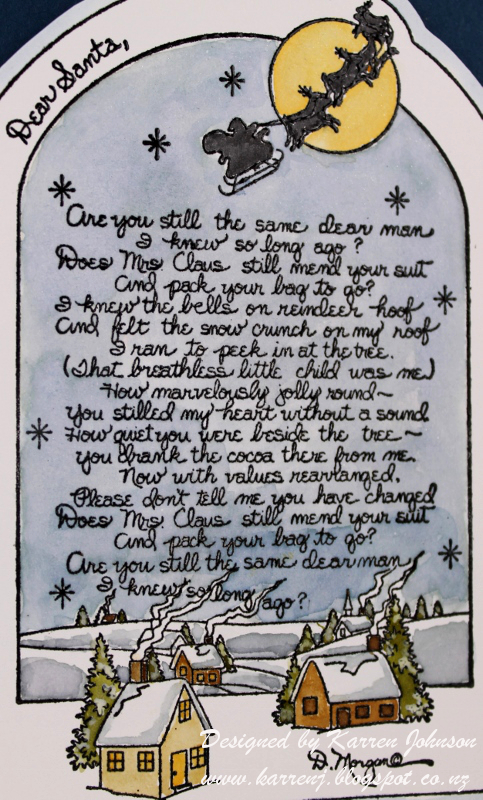 This is a stamp called Dear Santa by Stamps Happen and is a scene painted by the artist D Morgan. 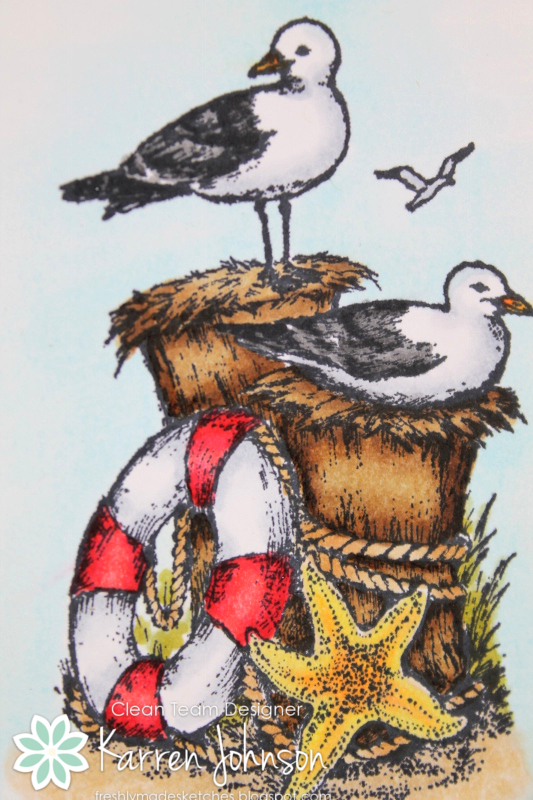 I've got a couple of her scenes which have been made into rubber stamps and they are gorgeous! Thanks for visiting. 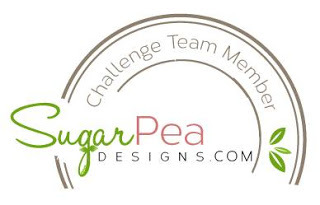 Be sure to check out the beautiful inspiration from the rest of the design team. I made my own background using the bokeh effect and watercolors. I splashed on some greens and yellows onto watercolor paper and when it was dry, I sponged over using white ink and a circle stencil. The die-cut sentiment has been sitting on my desk since March! Yes, March! I don't often keep UFOs as I tend to either finish the project or turf it, but this was made for a previous sketch and ended up not being used. 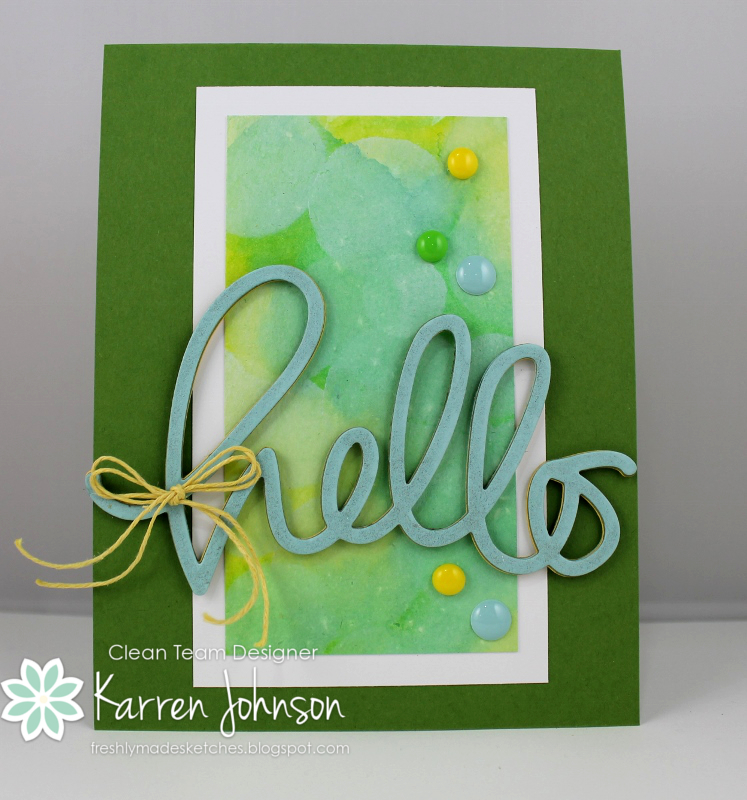 It's a stacked die cut using Pool Party, Gumall Green and Daffodil Delight cardstock, so it was perfect for this card. 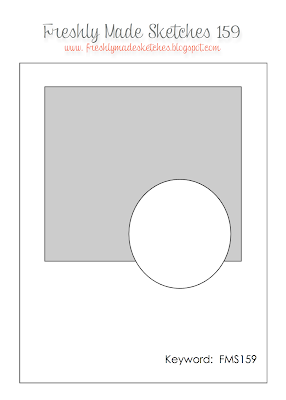 The double bow represents the star shape in the sketch. 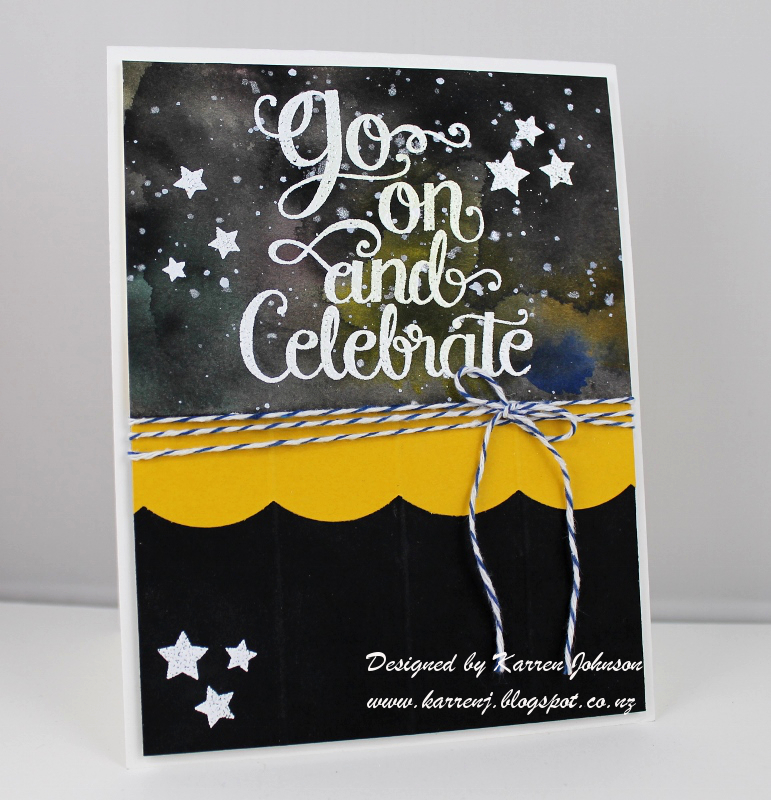 The die cut has been liberally painted with Wink of Stella for a lovely shimmer. 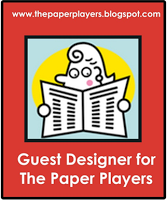 Thanks so much for visiting and I hope you've seen the rest of the amazing offerings from the rest of the design team.